One of my favorite blogs is FiveThirtyEight, which publishes a variety of articles that apply statistical analysis to topics ranging from Politics to Sports. In a comment on one of my youtube videos, someone suggested that I compare the various scram-kiting frigates, so I thought I'd try to apply a similar type analysis to this. This is by far the nerdiest post I've ever written, and I'm sure that it will appeal to maybe five people in total. A scram-kiting frigate is one that is designed to fight at a range of approximately 7.5 km. These are very common in low sec faction warfare, and typically fit an afterburner, a warp scrambler, and web in their mid slots. These types of fits are a "hard counter" against brawling ships that fit microwarpdrives (MWDs), and are very strong against brawling ships that fit an afterburner, provided that they are able to control range for long enough to get the kill. I make no claim that my fits are the best ones. Although I try to play to the ship's strengths, I have a personal bias towards maximizing DPS, active tank potential, and speed (roughly in that order). As such, I tend towards fitting damage rigs, and I avoid fitting any armor plates. I have flown many of these fits in actual combat, but not all of them. If you can link a better fit for any of these ships, then I'm happy to re-run the numbers. The Punisher and the Slasher are missing here, because I think they aren't viable scram-kiting ships (at least not in a conventional sense). The Punisher only has two mid slots so it's unable to control range against anything, and the Slasher has anemic DPS at scram range. Speed: Maximum speed in m/s, with a heated afterburner. Every ship has a T2 afterburner, no speed mods, and no speed rigs (such as polycarbons). This provides a good basis for comparison of the various hulls. DPS: Pretty self-explanatory. The DPS number in the column assumes that guns & launchers are being heated. For ships with drone bays, I used Hobgoblins for this calculation. EHP Buffer: This is the passive EHP buffer that's given in EFT. 1. All active tank modules are being heated. Every fit I am using has either an Ancillary Armor Repairer (AAR) or an Ancillary Shield Booster (ASB), or both, in the case of the Breacher. 2. All 8 charges in the AAR and all 9 charges in the ASB are used, but no additional charges are used once the charges run out. This won't necessarily happen in a real fight; a high-DPS ship could potentially do enough damage to kill you before you get all your charges off, or you could potentially get some extra cycles once the charges run out. 3. The ship gets the full EHP rep amount from every charge in its AAR or ASB. There are no charges wasted by "over-repping" when your HP is already full. 1. A mirror-match vs. another scram-kiting frigate. This type of fight is a straight DPS vs. EHP race on both sides. Whichever ship has a better combination of DPS and tank will usually win, although whichever ship is faster can typically disengage at will and warp away. 2. A match vs. a brawler. A brawler tends to have have weapons with much higher DPS and much better tracking than a scram-kiter, but at the cost of having much shorter range. A scram-kiter will win if he's able to control range outside of the brawler's optimal range. A scram-kiter will lose if the brawler is able to close range to where he can apply his full damage. When I first joined the Tuskers in 2013, the Rail Incursus and the Breacher were generally considered to be the kings of these kinds of matchups within the corp. What has changed since then are the buffs to small beam lasers, and the introduction of small transverse bulkhead rigs, which give a +20% boost to hull HP. This change greatly boosted the DxHP of both the Tormentor and the Executioner compared to their pulse-laser variants. The Tristan, having the most structure HP of any T1 frigate, benefited the most from the introduction of the bulkhead rigs. With the buff to small beam lasers, the Tormentor is #1 by this DxHP figure of merit by a long shot. It's somewhat balanced by its below average speed and by being locked into dealing only EM and Thermal damage. The Tormentor is also fairly one dimensional; regardless of whether it's fit with pulse lasers or beam lasers, and the way the Tormentor's opponent would approach the fight is roughly the same in either case. This can make it very easy to counter (for example by loading up on EM resistances or by bringing a ship which can fit a tracking disruptor). Despite this, I think CCP went a little bit too far with their changes to beam lasers, and right now they're probably a bit too strong. To be fair they were one of the worst weapon systems in the game prior to the change, and it's great to see people using them now. The rail Incursus and Breacher are also both very strong by the standards of DxHP, mostly because of their strong active tank. This is somewhat balanced by the fact that it requires excellent module micromanagement in order to gain the maximum benefit from your active tank. If you run the modules when repairs aren't needed, then you risk wasting charges. This is especially true for the Breacher, which has two active tanking modules! The Incursus has average speed and the Breacher's is slightly above average. The Breacher also has a relatively small signature radius (36 km) and full damage type selection. Their performance can get a little bit out of hand when adding Blue Pill boosters and Crystal implants to the Breacher, but otherwise I don't think these ships are imbalanced at all. On the other hand, I believe that the Tristan is a bit too strong right now. It's main strength has long been that it has a very wide variety of viable fits; they could be brawlers, triple-neut fit, scram-kiters, or fit as a long-range MWD kiter. However, the versatility came at the cost of not excelling in any particular role. A scram-kiting Tristan would never beat a Tormentor or a rail Incursus for example. The introduction of the bulkhead rigs gave the Tristan a major boost to its EHP potential without any trade-offs whatsoever. It actually has more buffer EHP than a Kestrel with a Medium Shield Extender! Furthermore, the drone rebalance 1 year ago made acolytes very strong, so it effectively has full damage type selection now (whereas before only Hobgoblins and Warriors were viable). I think CCP should really consider reducing the Tristan's base structure HP in order to compensate. The bottom tier ships are the rail Atron, pulse Executioner, and the shield rocket Condor, and I think that these should probably not be used right now as "pure" scram-kiting ships in the current low-sec meta. Each of these ships is great with different fits thought. The Rifter deserves it's own discussion (more on this later). The mid-tier ships in terms of DxHP are the Pulse Tormentor, the Rail Merlin, the Kestrel, and the Beam Executioner. The Executioner perhaps does slightly too much DPS right now (thanks to the beam laser buff), but is hardly out of control. It's thin buffer and weak active tank means that it likely won't win a fight against the other top-tier scram-kiting ships. What it excels at is it's ability to freely disengage from a fight because of its speed. I am personally not a fan of the Merlin for solo PvP because it is ridiculously slow, but it's certainly a serviceable scram-kiting ship. It's also fairly versatile, in that an armor-tanked version can utilize an extra mid-slot for e-war (in the form of a tracking disruptor or a second web), which can give it an edge in certain matchups. It's also fine as tanky fleet tackler or in a brawling frigate gang. I actually think that the Kestrel is pretty good and that it has advantages that aren't well-captured by the DxHP metric, specifically that it has 100% damage application at any range within heated web range (regardless of transversal), and that it has full damage-type selection. When fighting a brawler, the scram-kiter wins by staying outside of the brawler's optimal range (where he cannot be hit). This is easy for the scram-kiter when the brawler is in a slower ship, and such a match-up is typically an easy win. The more difficult fight is when the scram-kiter is up against a brawler that's faster than him. In this case, the brawler is eventually able to get to a range in which he can easily out-damage the scram-kiter. The scram kiter wins by trying to keep his distance for as long as possible, during which he applies all his damage to the brawler so that hopefully by the time the brawler is able to get in close then he will have taken too much damage and it will be too late for him to win. I created another metric to evaluate how well a scram-kiting frigate would match up against a fast brawling ship. I call this the "Brawler Figure of Merit" (BFM), and it is a reflection of how well a scram-kiting ship can control its distance and apply damage against a fast brawling ship who is trying to close in to his optimal range. I'll discuss the methodology in the next paragraph. If you don't care, or if it confuses you, just keep in mind that higher BFM is better, and it's determined solely by the DPS, speed, and projection of the ship, then go ahead and skip to the table. Where DPS is the dps of the ship and SPEED is the speed in m/s with an overheated afterburner. The origin of the other numbers come from a hypothetical match-up against the quintessential "fast brawler": a Dramiel. A Dramiel fit with a T2 afterburner and no speed mods will move at 2018 m/sec with its afterburner overheated, and if both you and Dramiel opponent apply webs to one another, then your velocities will be reduced by 60% (or multiplied by 0.4). 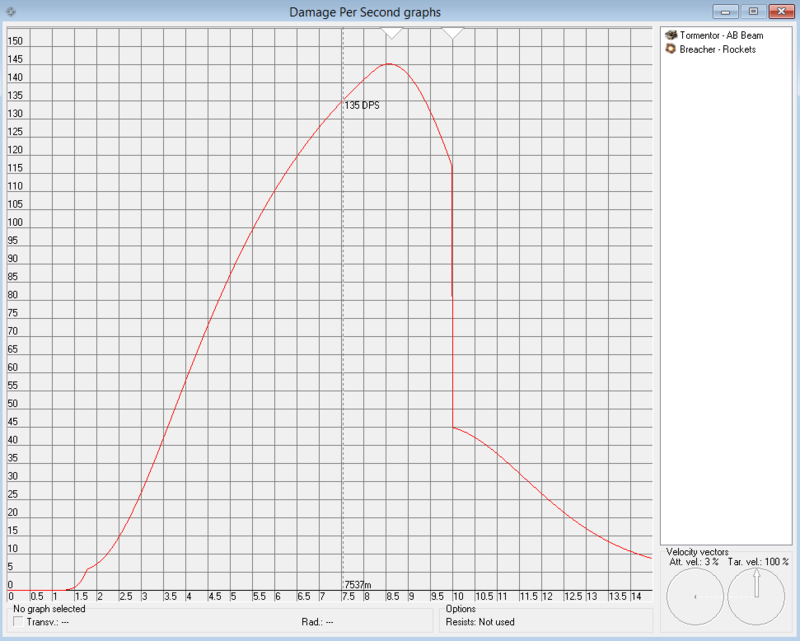 Assuming that the fight will start at over-heated web range (13 km), and that the Dramiel will start applying significant DPS and/or get under your guns when it gets to within a range of 5 km, , and this is the time during which you have to apply your damage. Your ability to apply damage to the Dramiel is limited by the maximum projection of your ship, which is why this factors into the equation. For turret-based ships, I used optimal + falloff / 2 for this number, for missiles I used the optimal range. For the Tristan I chose 12000 as a guesstimate; it gets roughly 2/3rds of its damage from drones (which don't depend on range) and 1/3rd from its railguns. The number "6642" is the total EHP of a cookie-cutter T2-fit dual-prop Dramiel. This metric does underrate the missile and drone ships (because a Brawler can't "get under" their guns), and also probably underrates the pulse laser ships as well as the Rifter slightly, because they have superior tracking to the railgun and beam laser ships. A BFM of 1.0 means that the ship is capable of applying enough damage to kill this Dramiel in the time that it takes for it to burn from overheated web range to a range of 5 km. Whether it is realistic for the ship to actually beat a Dramiel, I'll leave up to you. BFM favors the faster hulls with good projection, particularly the Atron and the (Pulse!) Executioner. The Tristan also comes out looking pretty good, especially considering that the BFM will slightly underrate a drone ship's actual performance against a fast brawler. A Pulse Tormentor also looks surprisingly good, and it's worth noting that BFM does not consider that it's capable of switching to multifrequency crystals and acting as a pretty decent brawler in its own right. The ships that don't perform well are the Incursus, Merlin, and to a lesser extent the Beam Tormentor. This makes sense, especially considering the relatively poor tracking of railguns and beam lasers and the below-average speed of the ships carrying those weapons. The Rifter on the other hand, is unique among these ships in that it is actually somewhat of a "fast brawler" itself. It's fit with short-range autocannons and what allows it to be a scram-kiter is its falloff bonus, and therefore I think the BFM doesn't well represent the Rifter here (I still think it's not a good ship, just not 0.3 points worse than a Merlin!). As an example, a fight between this Rifter and a blaster Atron is more-or-less just a close-range brawl. 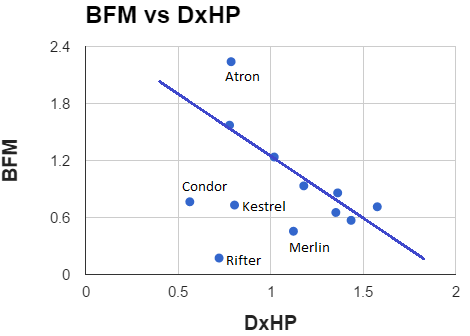 It's also notable that the ships with good DxHP tend to have low BFM, which feels relatively balanced; the better your ship is at a pure DPS race at 7.5 km, the more vulnerable you are to being out-brawled at close range. An MWD kiter will be trying to fight you at a range of approximately 18-22 km, which is outside of your over-heated web range and inside of warp disruptor range. This is also usually outside of a scram-kiter's optimal range. If a scram-kiter is unable to land his scram & web early in the fight, then he is unable to control range and he is going to have a very difficult time winning the fight. An AB-fit ship usually doesn't have enough speed to slingshot properly. Again, higher KFM is better. The numbers 4804 and 189 are the total EHP and DPS of a common Slicer fit that is using scorch ammo, and thus a KFM > 1.0 means that the ship could conceivably win a pure DPS race against a Slicer at a range of 20 km. Whether it is actually realistic for the ship to either beat or force a Slicer to retreat in a real fight, I'll leave up to you. Ships armed with pulse lasers and rockets have limited projection, and typically cannot apply any DPS to a kiting ship. Many of the ships have 0 KFM for this reason. The Rifter's DPS with barrage at 20 km is so low that it may as well be zero. Although, the Kestrel technically does have >20 km optimal range when using javelin rockets, because of the mechanics involved with missiles chasing a moving target, I do not believe that it is realistic for a Kestrel to reliably hit an MWD kiting ship. The Tristan scores very well here because of its drone-based DPS. This is also somewhat unrealistic, because against a fast-moving kiting ship drones will sometimes have difficulty keeping up with a moving target. Even if only 50% of the damage were applied though, the Tristan still performs better than nearly every other T1 frigate hull in the game. The other ships which match up well are the tankier ships which are armed with beam lasers and railguns: The Tormentor and the Incursus. 2. 100% application against a webbed target, regardless of range or transversal. This gives rockets a couple advantages in a 1v1 against turret-based ships: they can attempt to either orbitr close against railguns and beam lasers, and they can maximize transversal if they're in a dps race at 7 km against pulse laser ships. This allows them to perform above their "DxHP" in a dps race against other scram-kiting frigates. At 7.5 km, by maximizing transversal, the Breacher is able to reduce incoming DPS to 135 at 7.5km! And it's reduced by even more at closer ranges! This is a 30% reduction to the incoming DPS, In this scenario, the Breacher would still be applying the entirety of his DPS against the Tormentor. Rockets still apply all of their DPS against their target even at brawling range, giving them an extra edge against fast brawling ships because they can't exploit the tracking of a missile ship. This is why I think that the Breacher and Kestrel are far better against scram-kiters and brawlers than their raw DxHP and BFM numbers indicate. Poor, poor Rifter. It's out-classed in virtually every metric that I could come up with. While I don't think that it's a good ship, I think it's probably slightly better than what the numbers suggest. It's gotten better ever since its tracking bonus was replaced with a falloff bonus. Because it can use autocannons, it has the highest-tracking of any scram-kiting ship in my list, meaning that in principle it can be a pretty good brawler without refitting or even changing ammo. It also has above average speed, and a relatively small signature radius (35km - same as an Atron). Given all those advantages, the Rifter is still out-damaged by the pulse Tormentor with dual-light pulse lasers at all ranges, and it's out-damaged by a blaster Atron with ambit rigs and null ammo at every range beyond 5km. It also has below average EHP, not good for a brawler, Its slot layout isn't helping matters either, as it is sorely lacking in low slots that would help it boost its DPS, EHP, or speed. While the same fit can either scram-kite or brawl, it's really not very good at either. While the falloff bonus is great, the Rifter still needs some help. I think adding an extra low slot without adding CPU would be a decent change. This would allow it to fit an overdrive or an adaptive nano plating in order to address one of its shortcomings. The Tristan is extremely strong at the moment, thanks to the introduction of hull tanking rigs. It also has the ability to apply damage exceptionally well at any range, which gives an extremely wide engagement profile. I honestly think that it needs a slight nerf. I also believe that CCP buffed small beam lasers a little bit too much, and that a reduction to their DPS of ~10-15% wouldn't be unreasonable (alternatively, they could increase the CPU requirements). I think the Merlin is too slow and too vulnerable to fast brawling ships. Additionally, being shield tanked is a pretty big disadvantage against laser-based ships, which are becoming more and more common today. The Rail Incursus is pretty much just plain better. The Condor and the rail Atron are very bad against other scram-kiters because of their poor EHP and DPS capability, and the Pulse Executioner just looks inferior to the beam version is the vast majority of situations. I probably wouldn't use a Rifter either. This ship still needs some help. However, I'd like to try it out for myself (I've never really flown one!) before I render a final judgement. Iddo, thanks for this (and your other posts/videos)! Been in FW for a couple months and with help like this it makes scaling the learning curve much quicker. As for the Rifter and Puinsher. I agree but I REALLY want to find a good use for them. Being seen as weak will bring more fights but I haven't found a half-decent fit for the Rifter. There is a 10MN Punisher that would be entertaining but very much a niche usage. If this article has one fault it's that not enough people have read it. I'm linking you on reddit (via my own blog). Great work, best Eve blog article of the year so far. Very very interesting stuff. I've been flying a pulse Tormentor as my main solo T1 frig in RvB for about four months now. Generally I've noticed the same strengths and weaknesses as you have. My W/L record with it is okay; a lot of that is down to pilot error rather than the fit itself, though. I do think it's stronger against real world MWD-kiters than it is on paper; with an overheated AB it is /just/ fast enough to slingshot an inattentive Condor or kite-Tristan pilot. I've found it helps to bait tank a little bit; generally when you start dipping into structure the other guy becomes less concerned about keeping range (they're more worried about letting a "sure" kill off the hook!). I've EVEFit'd a beam Tormentor but haven't tried it yet; from this article it sounds as if I need to fit a few up and go shoot some nerds. I haven't flown much with small beams in general, but when I have used them I've liked what I've seen. As Stabs said, the biggest fault with this article is that not enough people have read it. Will post a link to RvB tonight; I think there's a lot of people there who'd find this interesting. Wow, awesome post! I've flown every one of these ships with the same or close to the same fittings, and while I've never done the full math to compare the ships, your study confirms my experiences. Probably my favorite frigate of all time has to be the dual tank breacher, and for all the reasons you point out. However, which of these ships do you perter in the "current meta"? IMO, the Tristan is the only one that can at least sometimes force Slicers away, and Slicers are basically everywhere, and it can also hold its own against kiting Tristians, which are also basically everywhere. One question about the fittings though: for the Tristan fit, you use 3x Small Transverse Bulkhead I, but why not tech II versions? They are only about 2m each right now and provide maybe 500 more ehp? I've never liked flying the FOM meta frigates all that much. I haven't sat in a Tristan in probably about a year and a half. I find that you get more fights and more kills by flying "off-meta" ships or by using different fits. I used to like flying a rail Incursus because it seemed like every single Incursus pilot would only fly dual-rep blaster fits. Other people in scram-kiting ships would see me and expect to be able to win easily (because a dual-rep Incursus has zero range control), and be surprised to discover that a rail Incursus not only exists, but is actually one of the strongest scram-kiting T1 frigates in the game. Interestingly enough, probably the only "current meta" ship I fly is the Slicer because it's pretty unique in its ability to engage frigate gangs. Actually, I find Tristans to be extremely easy to beat with it. The best ship at forcing Slicers away is probably the AB rail Comet, which are also basically everywhere in FW now (you can thank CCP's infinite wisdom in making zero-penalty bulkhead rigs for that). When I want something different, I like the MWD rail Comet, which is basically about 85% as good but is less expected because pretty much nobody flies an MWD rail comet. No reason for T1 bulkheads as opposed to T2. I actually was not aware of how cheap they are.